More of the same from the Trib’s pollsters. 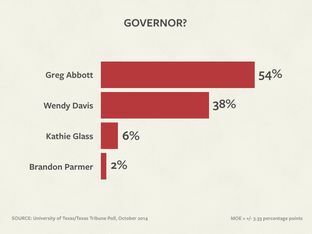 Republican Greg Abbott has a 16-point lead over Democrat Wendy Davis in the closing days of this year’s general election for governor, according to the latest University of Texas/Texas Tribune Poll. Abbott has the support of 54 percent of likely voters to Davis’ 38 percent. Libertarian Kathie Glass has the support of 6 percent, and the Green Party’s Brandon Parmer got 2 percent. Among men, Abbott holds a 61-32 lead in this survey. And he leads by 2 percentage points — 48 to 46 — among women. Abbott leads among likely voters who dropped out of high school all the way up to those with post-graduate degrees. Davis leads with voters who said they never attend church services, but Abbott leads with every group that did, no matter how frequently or infrequently. With Anglo voters, he holds a 62 percent to 31 percent advantage. Davis leads 75 to 19 among black voters and narrowly — 48 to 46 — among Hispanic voters. Most of the statewide races are not as close as this one, the poll found — and Republican candidates hold the lead in each one. It’s more of the same for the other races as well. You know my issues with their methodology, so I’ll just note two points. One is that since August, Internet-based pollsters UT/TT and YouGov have shown Greg Abbott with a wider lead than the phone-based pollsters have, with the exception of that KHOU poll. It’s either about a 16-point race or about a ten-point race, depending on who you think is more believable. Also, if you take the UT/TT poll’s word for it, Davis’ problem isn’t so much turning out her base as it is holding on to them in the first place. When was the last time a Republican candidate in Texas won nearly 20% of the African-American vote? We’ll see what the exit pollsters have to say about that. In the meantime, early voting continues. Let’s just concern ourselves with taking care of our own business there.